Earn up to 34,712 reward points. Interchangeable bells with widely disparate attributes. The DBX Large Bore X-Series trumpet offers the performer a chance to customize their instrument with interchangeable bells. 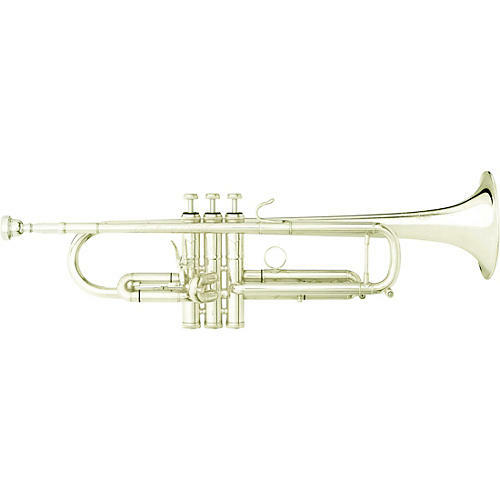 The DBX trumpet features a .462-inch large bore plus interchangeable #43 taper bells, one in gold brass with traditional round bell rim and one in yellow brass with a French bead flat rim, designed for a quick response due to the unique screw bracing for the bells. The yellow brass bell offers a vibrant sound for all-around playing, while the gold brass bell offers a warmer orchestral sound. The reverse leadpipe design allows for less resistance that enhances the large bore design for a very free-blowing instrument. The 1st valve trigger allows for easy intonation adjustment. The DBX Large Bore X-Series includes a double case and mouthpiece and is available in silver finish. Versatile arrangement for the player who addresses multiple styles. order soon.